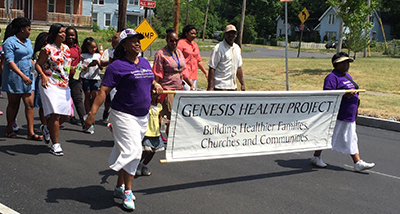 A $500,000 grant from the New York State Department of Health (NYSDOH) will fund programming to deliver Alzheimer’s Disease and caregiving support to the African American community in Syracuse —including respite care and connections to community resources—as part of the Genesis Health Project. This initiative, led by Falk College, is part of the NYSDOH’s Alzheimer’s Disease Program, which implemented a $25 million strategy in 2015 to support people with Alzheimer’s Disease and other dementias and their caregivers. The Genesis Health Project has launched an initiative to provide support African Americans with dementia and their caregivers. The goals of the African American Alzheimer’s Dementia Caregivers Support Program (AADCS) are to provide Alzheimer’s and dementia education to inner-city African Americans and increase use of available resources to diminish caregiver stress. The programs include educational seminars and cultural competency training for community-based partners. A 12-week Healthy Living Program was launched Aug. 13, encompassing Alzheimer’s Disease and nutrition education, exercise sessions, and yoga and meditation. Launched in 2004, the Genesis Project is part of a larger minority health initiative, in partnership with Falk College, corporate donors, government agencies and other regional partners. The multi-year, community-based initiative aims to reduce health disparities and to promote healthy lifestyles among African Americans. Targeting underserved populations in the area through a network of health advocate volunteers at local churches, the Genesis Project has focused on health issues such as diabetes prevention and management, obesity, and prostate and breast cancer awareness and education in addition to its newest focus on Alzheimer’s Disease and dementia caregiving. providing self-care and stress management education for caregivers in African American faith-based communities. Cowart’s academic interests are focused on public health and health education among minorities, community partnerships and interdisciplinary collaborations, health disparities and mental health issues. Brown is a social gerontologist who studies later-life experiences of socioeconomically disadvantaged individuals, women and racial, ethnic and sexual minorities.